Anno VII silver Half Piastra. Obverse: Coat of arms. 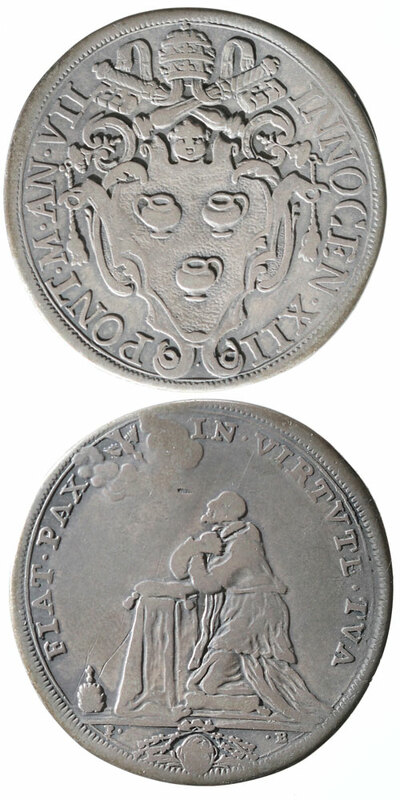 Reverse: Pope Innocent XII kneeling in prayer before the Holy Spirit; around, FIAT PAX IN VIRTVTE TVA ("Let there be peace in thy strength" (Psalm 121:7)); in exergue, coat-of arms of Msgr. Maffeo Farsetti. Engraved by Swiss medallist Peter Paul Borner out of Rome. VF/Nice Fine, original toning, never cleaned.